Rapeseed. The crop with quite possibly the worst imaginable name to try and market as a health food source. A plant with undesirable components, such as erucic acid and glucosinolates, and lacks many necessary attributes to be successful in today’s marketplace. Everything changed when several Saskatchewan scientists decided to take this cool-season crop, relatively well adapted to life on the prairies, and convert it into something amazing; we now call it canola. In the Canadian Prairies, we generally do not receive enough heat in a growing season to successfully grow corn or soybeans on a large scale (although that is changing with new varieties- a topic for another day). Traditionally, we are known as wheat growers, and for good reason. We export a pile of wheat from our farms, and we always have. Canola is relatively new, but it has been a godsend for us. Rapeseed, the origin plant for canola, was grown in Asia for thousands of years for cooking and lamp oil. With the introduction of the steam engine in the eighteenth century, rapeseed oil was proven to be a very useful oil, and was grown extensively in Asia and Eastern Europe before the Second World War. During the war, rapeseed supplies were short in Canada, and it became a cropping option for many farmers. But, prices weakened after the war, and acres slumped. 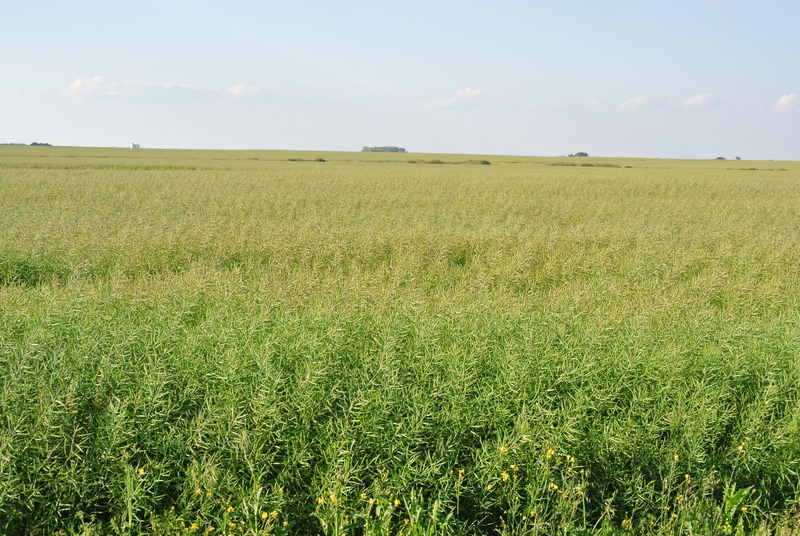 Saskatoon was the birthplace of rapeseed research on the prairies, and after 25 years of work by many brilliant scientists and technicians, a new crop was developed. Indeed, this plant was so different from the rapeseed it came from that it needed a new name to differentiate it. In 1978, “canola” was coined from “Canada” and “oil”. Since this incredible innovation, canola has overtaken wheat as the primary crop of choice for prairie producers, with over 20 million acres grown in 2012. It is now grown in many areas of the world, including Australia, Brazil, Europe and the United States. Yes, this crop is genetically modified. No, it is not a Monsanto product. 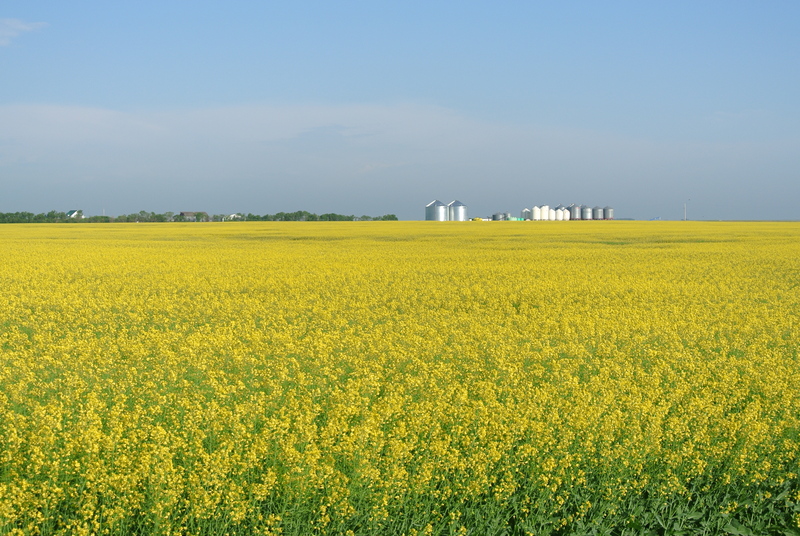 There are a few different companies that produce canola genetics large-scale, including BASF, Monsanto and Bayer CropScience. Bayer has been immensely successful with its InVigor line of canola, which is our farm’s genetics of choice. Try not to look at the GM crop as “evil”, as these varieties have saved us from having to use much more toxic chemicals to control weeds in this crop. 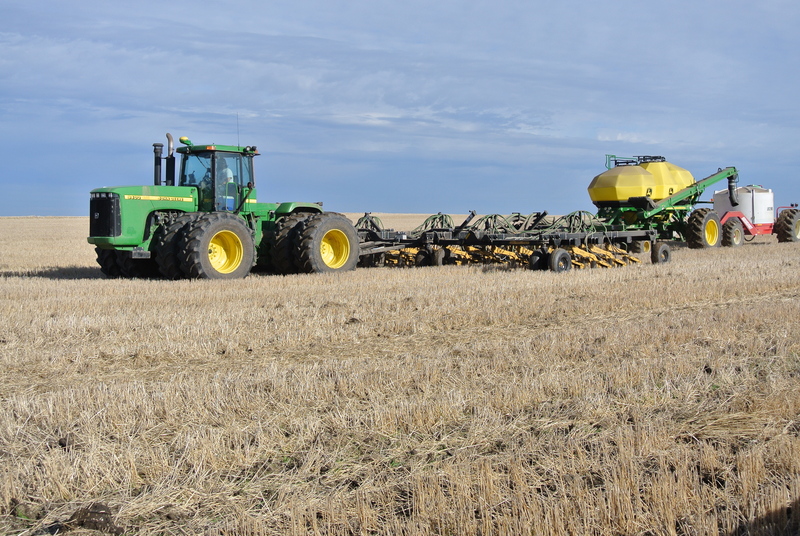 Glyphosate and glufosinate tolerant canola has allowed us to prevent the overuse of many chemicals that are prone to cause weed resistance, despite what you hear about glyphosate resistance. We would be in trouble without these chemical options, which would damage not only our economy here, but it would limit access to one of the world’s healthiest options for cooking oil. Canola has an excellent mix of saturated, monounsaturated, and polyunsaturated oils, which have been linked to a reduction in cholesterol levels, among other benefits. 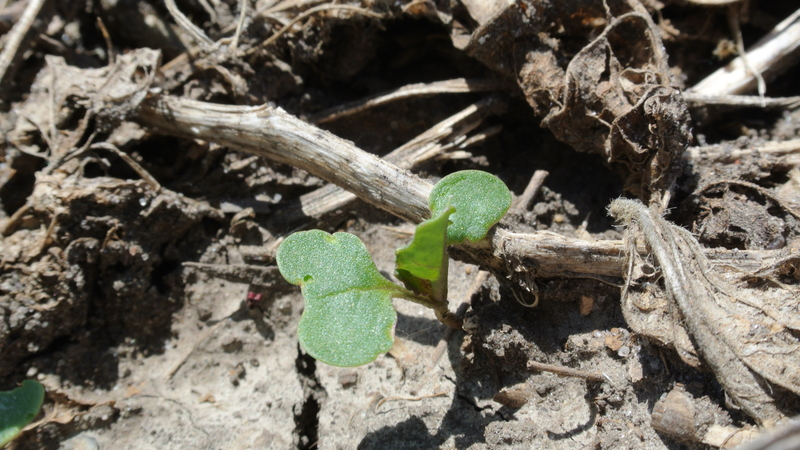 It is at or before this stage that we try to apply a weed control product, which for this variety is glufosinate (Liberty) and clethodim (Centurion). Since canola is genetically resistant to glufosinate, and because clethodim is a product that works only on grassy weeds, the canola will not be injured (unless excessive rates are applied, in which case injury can occur). 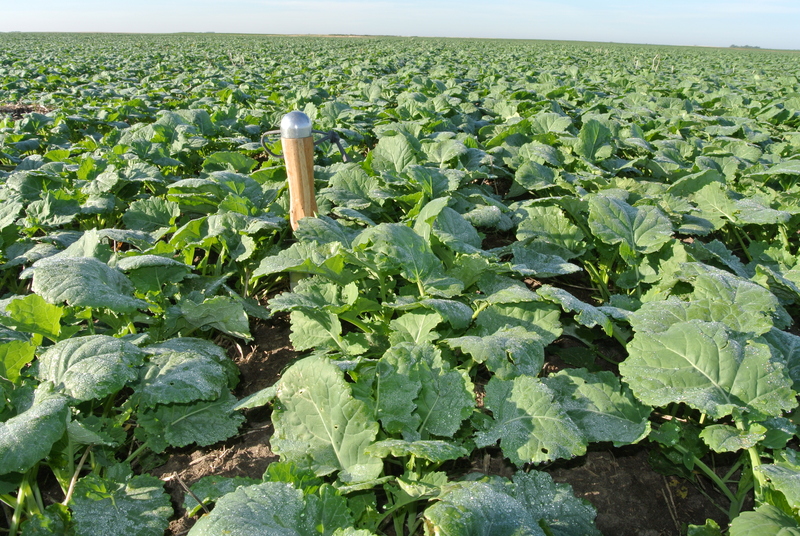 In the next photo, you will see canola reach a stage that will make any farmer excited- rosette stage. This is where the hybrid vigour of canola really hits hard. These leaves are six inches in length, allowing them to gather a great deal of sunlight energy. The ground is now essentially covered, preventing germination and growth of weed competition. Again, this is another benefit of these powerful varieties. 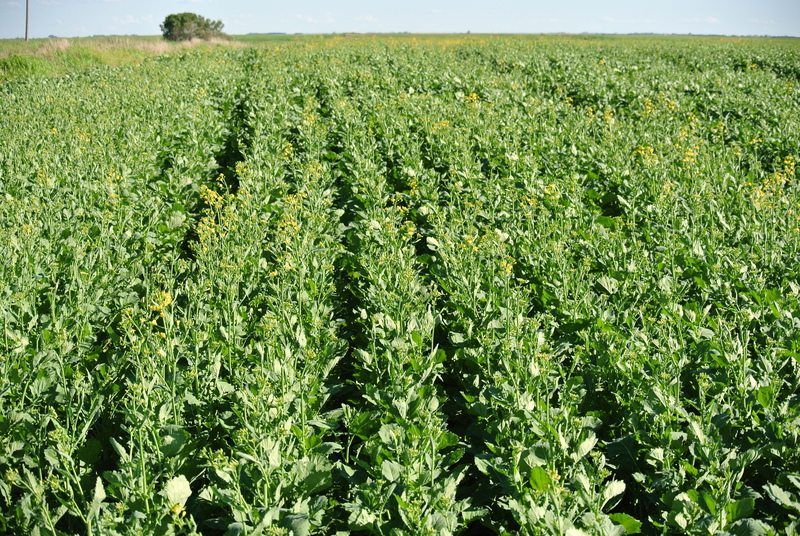 In other crops, the ground is not covered as quickly, and more chemicals therefore are needed to control weeds. Once canola reaches this stage, weeds are no longer a concern. These plants are using a huge amount of nutrients at this point, consuming lots of nitrogen and sulphur every day. For a crop like this, synthetic fertilizers are a necessity. There is no way organic farming can provide enough nitrogen, sulphur and phosphate to allow this crop to reach its potential. For this reason, we apply nitrogen, phosphate and sulphur at seeding time. 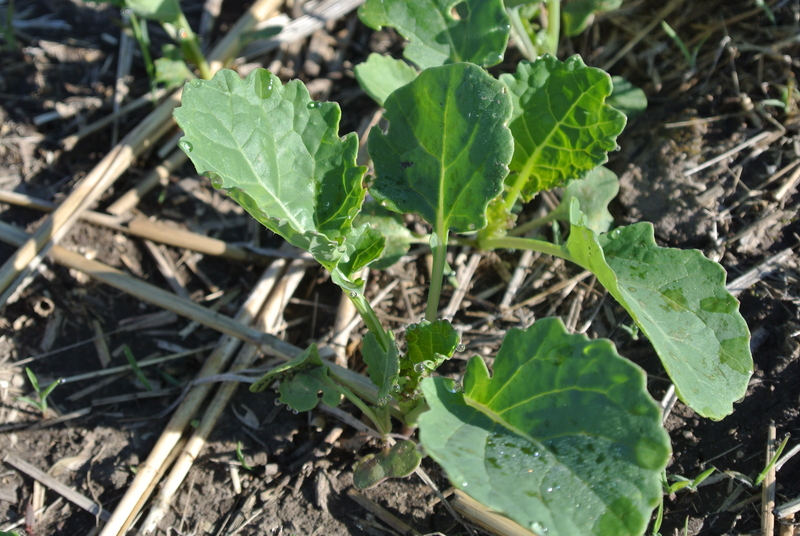 In the next photo, you can see canola push past rosette stage into stem elongation, or “bolting”. Farmers refer to this stage as bolting because of how quickly the stem grows up from the base of the plant. While it usually takes a month to reach rosette stage, bolting happens within a week. In the Prairies, the striking beauty of these fields now is a common sight. As the flowers unfold, pollinate, and eventually fall to the ground, more flowers continue to develop in a seemingly never-ending loop. Generally speaking, the longer this crop flowers, the better the yield. Hot weather, especially above 30 degrees Celsius, is very damaging to these flowers, causing them to “blast”. The flowers will simply dry up and pop off the stem. Consecutive days of weather like that is very damaging to yield. This crop uses a lot of moisture, and rain at this time of the year always puts a smile on farmers’ faces. There are a few dangers at this time of the year. Weeds are no longer a concern, but disease and insects are. Sclerotinia sclerotiorum is the primary disease of concern (Sclerotinia Stem Rot, or just Sclerotinia). The flowers are littered with spores released from little mushroom-like organisms that live on the soil surface, and as they fall, they land on leaves and stems. The disease moves into the plant and chokes off the flow of nutrients from the root system to the flowers and pods. Fungicides control this disease, which are usually a worthwhile investment in warm, wet summers. Insects such as grasshoppers, lygus bugs, diamondback moth larvae and Bertha armyworms can induce severe damage to canola during flowering and into podding, chewing on stems, leaves and pods. We determine whether we need to spray for these insects by way of economic thresholds, which are developed by agronomists with government agencies. These economic thresholds are calculated from a number of factors: insect numbers, cost of application, value of the crop and number of predatory insects that will feed on the negative ones. We always try to spray in evenings and early mornings, as bees tend to forage in the heat of the day. Spraying insecticides is not fun, and it is very expensive to do. We avoid it as much as we can, but sometimes we must spray to save our crops from utter destruction. As flowering finishes up, generally after 2-4 weeks, the fields lose their yellow colour and pods are the dominant feature. Each pod contains many little seeds of canola, which slowly mature over a period of 20-30 days after flowering has finished. Once flowering is completed, the countdown to harvest begins. Our canola is in a variety of stages, with some still yellow and some just like the picture shown (obviously; that is where the picture came from!). Swathing occurs about 20-30 days after flowering ends, with harvesting occuring 10-18 days later. We are excited for this time period to come. Hopefully this has given you some information of value on our most economically important crop. Canola has been a wonderful experience for us, and it will be a part of our rotation for the foreseeable future. If you want to know more about crop diseases, insects, and other parts of crop production, check out some of my other posts. Now you know where your cooking oil comes from!